Increasing water use efficiency in agriculture is key to conserving this limited resource. Dr. ZhiQiang Chen from the University of Missouri-Kansas City set out to measure the effects of soil hydrophobicity when making irrigation decisions. This research is funded under a grant from the National Institute of Food and Agriculture at the USDA. The researchers will use a Cubert real-time snapshot hyperspectral imaging system from Bodkin Design & Engineering. An important characteristic of soil is its hydrophobicity, the property of soil that causes water to run off the surface rather than being absorbed. Dr. Chen’s colleagues, Dr. Eyal Ben Dor at Tel Aviv University and Dr. Rony Wallach at the Hebrew University of Jerusalem in Israel, have proven in lab and field tests that hydrophobicity can be detected with hyperspectral imaging spectroscopy. 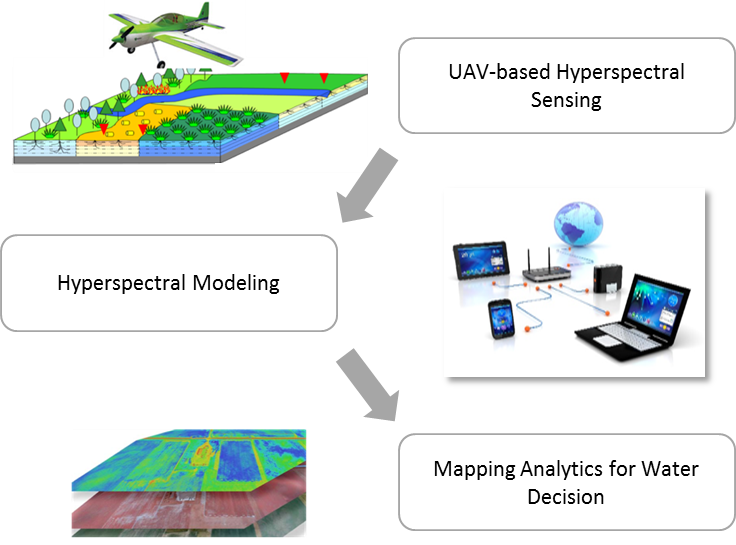 They will use the Cubert hyperspectral system in ground-based and airborne platforms to map this property, ultimately guiding precise water irrigation or the application of chemical agents to reverse hydrophobicity. This is particularly important in arid regions like Australia, Africa, and Israel. In the Western U.S., where wildfires are a common occurrence, burned soils become hydrophobic and lead to landslides and mudflows. Understanding hydrophobicity and being able to predict and remediate these types of events, as well as planning for storm water management, can save lives and property. These comments point directly to the need for snapshot technology which is accessible and easy to use for people solving complex global problems. Dr. Chen and colleagues plan to carry out field tests in Israel this year and expect to complete the project by March 2018. The team has one publication in review already and is looking forward to several more. For more information or questions about products and pricing, please contact Bodkin Design & Engineering at info@bodkindesign.com. Bodkin Design and Engineering, LLC has been providing hyperspectral imaging equipment as well as test and R&D services since 2003. Headquartered in Newton, Massachusetts, the company serves the international OEM, commercial, military, and research communities. Specializing in electro-optic and mechanical systems, BD&E has overseen the successful introduction of products in a wide range of markets from calibration equipment for infrared imaging, to a patented line of video rate hyperspectral imagers. To learn more, visit us at http://www.bodkindesign.com.